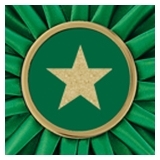 A Satin Center is available for any Award Rosette or Award Sash with a center option. There is an additional charge for each satin center. This is a popular choice for customers who would like their award rosette or award sash completely in satin. Rosettes or sashes with a satin center feature a logo or design hot stamped into the center of a satin covered button in gold foil. The satin center is available in any color that our solid satin ribbon is available in. To use your own logo or design, simply send us your artwork. We also have hundreds of stock designs from which to choose. View designs here. To customize a satin center with a new design, there is a die charge and art charges may apply if the artwork needs to be adjusted for any reason. Once this die is made, however, no additional charges apply on future orders of 200+ rosettes or 200+ sashes. A Gold Rim Center is available for any Award Rosette or Award Sash with a center option. There is no extra charge for a gold rim center. The gold rim is a classic choice that has been featured on rosettes and sashes for decades. Rosettes and sashes with a gold rim center feature a logo or design hot stamped into the center of a gold rimmed disc. The design is hot stamped in gold foil. The disc is available in any color that our solid satin ribbon is available in. To use your own logo or design, simply send us your artwork. We also have hundreds of stock designs from which to choose. View designs here. To customize a gold rim center with a new design, there is a die charge and art charges may apply if the artwork needs to be adjusted for any reason. Once this die is made, however, no additional charges apply on future orders of 25+ rosettes and 25+ sashes. 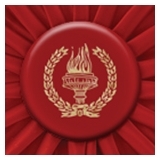 A Button Center is available for any Award Rosette or Award Sash with a center option. There is no extra charge for a button center. This is a popular choice for customers who would like to use a full color logo or design featured on their award. Customizing a button center with your own design or logo is FREE; however, artwork charges may apply if the artwork needs to be adjusted for any reason. The Mum Center adds a distinct detail to making an impressive award for your winners. 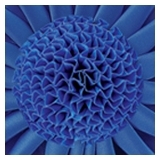 This option is available for select award rosettes and award sashes with a center option (See list below) and features a tightly coiled ruffle in a dome shape to resemble the center of a chrysanthemum flower. There is an additional charge for each mum center. Mum Centers are available in select colors that may vary slightly in hue. (See list below).